McALLEN — Growing from 40 to 160 employees in six years took a lot of resources for the manufacturer Grand Rapids Foam Technology, mainly training to help move workers up to higher-skilled positions and hiring those to replace them, said plant manager Dan Robinson. For companies like Grand Rapids settling in the Rio Grande Valley, in this case from Michigan, a big selling point was the availability of said worker training opportunities. And for the 22nd year, the McAllen Development Corporation awarded a grant to South Texas College aimed at providing job training to companies settled or seeking to settle in the city. The grant of $259,440 is expected to cover training expenses for anywhere between 800 to 1,000 employees, said Carlos Margo, STC associate dean of the office of training and economic development, as well as STC’s expenses to bring in those training opportunities. Since 2007 the city made the decision to focus these funds to manufacturing-related investments such as workforce training, with hopes to recruit and maintaining manufacturing in the city. Some of the most popular requests are the basic leadership, team building and customer service. But needs have evolved to include trainings like industrial maintenance, which includes electromechanical skills to maintain highly automated machinery; lean sigma, which helps a company work more efficiently and reduce waste, defects and down time; industry 4.0, which is the connectivity of all web-based aspects of production systems. Margo said, but the college works constantly to stay ahead of the latest technology and machinery used so that they can provide the latest skills to employers. And about 10 to 15 percent of the grant goes toward updating systems at the college, getting new certifications and curriculum. The return on investment is expected to be three to five times the amount of the grant, he said, due to increases in wages, new positions and productivity. Keith Patridge, president and CEO of the McAllen EDC, said the ability to find a trained and skilled workforce is the most important factor attracting companies to the city and the region. Some of the certifications that the college has gained have opened the door to conversations with companies. The partnership between the city and the college as well as the grant support is seen as something that needs to be ongoing in order to continue offering these opportunities to both the companies and ultimately the workers in the region who benefit from skill training. 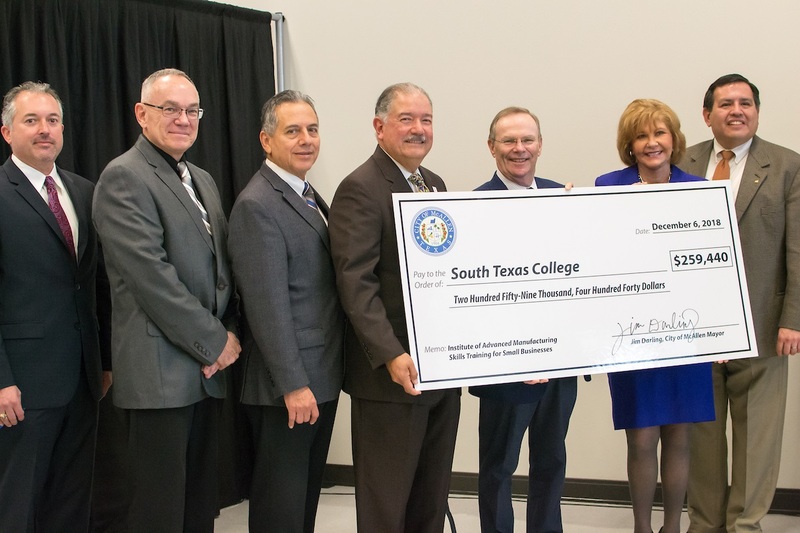 This story has been updated to reflect that the McAllen Development Corporation awarded the job training grant to South Texas College.